Memorial Day Weekend could be a little moist in the mountains and downright wet along the state’s Front Range, but at least there will be multiple ski areas open so snow riders can celebrate the start of the summer season in style. With a 53-inch very settled base of snow up top, Aspen Mountain will re-open May 24-26, offering 21 trails and 130 skiable acres. Arapahoe Basin Ski Area is still covered in snow for Memorial Day (A-Basin photo). 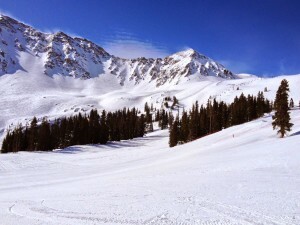 Arapahoe Basin, originally scheduled to shut down June 1, will re-open for at least one more weekend on June 6-8. And the Basin could stay open beyond that date if conditions warrant an extension. However, A-Basin COO and Vice President Alan Henceroth this week announced the closure of the North Side terrain and the Pali Lift. A-Basin was still reporting a 76-inch base on Tuesday, and the coming weekend weather could add to that total. “Look for thunderstorms in the eastern foothills and plains Wednesday through Memorial Day, with afternoon showers over the mountains Friday, Saturday, and Sunday,” Opensnow.com meteorologist Joel Gratz reported Tuesday. Gratz added that the Front Range could see some serious soaking Sunday into Monday, which means events like the Boulder Bolder 10K on Memorial Day could be a little interesting. “One thing to watch out for: the possibility of heavy rain along the front range and foothills on Sunday into Monday,” Gratz warns.